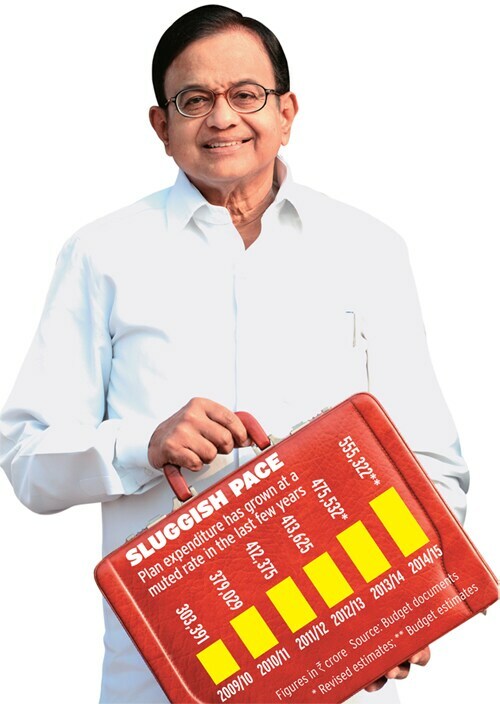 P. Chidambaram may have met his fiscal deficit target, but he has narrowed options for the next finance minister. Finance Minister P. Chidambaram's swan song will haunt his successor. As he highlighted his achievements in controlling the fiscal and current-account deficits on February 17 during the vote-on-account, the governments last budget before elections due by May, he also outlined a rather optimistic vision for 2014/15. Chidambaram drew upon dividends and profits of Rs 88,188 crore from state-run companies and also dipped into non-tax revenue to rein in the fiscal deficit at 4.6 per cent for 2013/14. He cut plan expenditure as well, a move that hasn't found favour with some economists. "Lower plan expenditure, which accounts for 30 to 35 per cent of the governments overall spending, will have a direct impact on economic growth, future tax collections and fiscal deficit targets," says Siddhartha Sanyal, Chief India Economist at Barclays. "The cut in plan expenditure cant be continued like this." Chidambaram is leaving behind a difficult task for the next finance minister - to keep the fiscal deficit for 2014/15 at 4.1 per cent. Why? He is keeping a tight leash on government borrowings. Net market borrowings for next year are estimated to be Rs 457,321 crore, down 2.5 per cent from this years revised estimates. But he has projected gross tax revenue to grow 19 per cent compared with 11.8 per cent this year. Similarly, indirect tax receipts have been estimated to grow 18.8 per cent. The targets seem high given the slowdown in the economy. "Your reach must be beyond your grasp? I set high targets," Chidambaram said after presenting the interim budget. A few more things will make the next finance ministers job difficult in keeping the fiscal deficit under control. Interest payments for 2014/2015 are estimated at Rs 427,011 crore, up 12 per cent from this year. The amount estimated for debt repayment jumps by a massive 51 per cent to Rs 247,173 crore. Overall, the next government will have to spend nearly two-thirds of its tax revenue for interest payments, debt servicing and subsidies - thats nearly half of the total expenditure. The share of subsidies has been lowered to 1.9 per cent of gross domestic product (GDP) next fiscal year compared with 2.2 per cent this year. "The process of fiscal consolidation will be next to impossible without focussed subsidy reform... 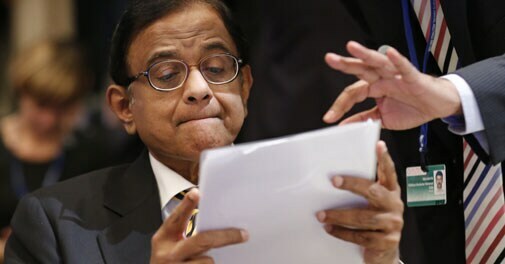 It is extremely essential to ensure that proper systems are put in place for better targeting of subsidies," Chidambaram said in a statement tabled in Parliament under the Fiscal Responsibility and Budget Management (FRBM) Act, 2003. 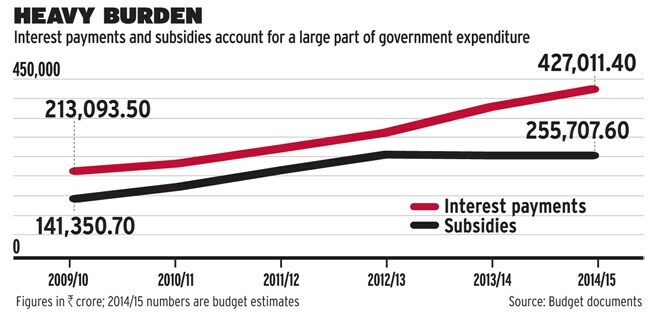 While total subsidies for next year are only marginally higher, Chidambaram rolled over Rs 35,000 crore of fuel and fertiliser subsidy payments to 2014/15, leaving the next government to deal with the problem. Moreover, the government will roll out the food security law in 2014/15. "The food subsidy scheme will have to undergo a massive overhaul with the introduction of the Food Security Act," he said. Analysts have raised doubts over Chidambarams calculations and assumptions. "The bigger issue is on the expenditure side. We have three huge subsidies, and the new government will face a big challenge," says Samiran Chakraborty, Chief Economist, Standard Chartered Bank India. Chakraborty says the excise duty cuts announced in the interim budget will also pose problems for the next government. "They have opened a Pandoras box. There is an expectation the cut will continue beyond June 30. Other sectors would also raise similar demands," he adds. In the interim budget, Chidambaram cut excise duties on a few sectors such as automobiles, capital goods and consumer non-durables. The new finance minister will have two options to keep the fiscal deficit under control. One, cut back on expenditure. Two, increase expenditure - which is essential for growth - even at the cost of slippages and look for alternative sources of revenue. The FRBM Act mandates a reduction in the fiscal deficit of about 0.6 percentage points in each of the coming three years to reach three per cent of gross domestic product by 2016/17. In a slowing economy, with tax revenues on a slide and the tax-to-GDP ratio falling, the new finance minister can either revise tax rates, expand the tax base or ensure better compliance. Indias tax-to-GDP ratio reached its peak in 2007/08 at 11.9 per cent and then slid to 9.7 per cent two years later. In 2012/13, the ratio was 10.2 per cent. But, it is still one of the lowest in the world. The new finance minister would have to continue with the diesel price decontrol policy to keep fuel subsidies under control. But curtailing expenditure on welfare programmes such as the Mahatma Gandhi National Rural Employment Guarantee Act and the Food Security Act will be difficult. "Schemes like MNREGA and the Food Security Act are holy cows which cant be touched," says Abheek Barua, Chief Economist at HDFC Bank. He says Chidambarams obsession with keeping the fiscal deficit below 4.8 per cent is turning out to be dangerous for the economy. "Just because he announced a 'red line, he cant make the job of the next finance minister tougher," Barua adds.